Wyoming plays its fifth consecutive and final Mountain Division game of the season at Air Force Saturday night. Kick off is at 8:15 p.m. MT at Falcon Stadium. The game will be televised on ESPNU. 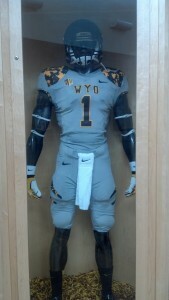 Play keep away: An oldie but a goodie this season for Wyoming, but one that best fits this game. The Cowboys stand a lot better chance of winning if their offense can go on sustained drives, finish with points and keep the Falcons’ triple-option offense off the field. This is what Air Force wants to do, and has done most of the season as it leads the Mountain West in scoring at 34 points per game, and is 10th nationally in time of possession at 33 minutes, 29 seconds per contest. The longer Air Force has the ball, the more UW’s defense can wear down and be susceptible to giving up big plays. Yes, no or am I completely off my rocker? Convert scoring chances: Wyoming hasn’t had a problem moving the ball offensively at 396.4 yards per game. But it has had trouble scoring at 19.4 points per game. The Cowboys are last among 127 Football Bowl Subdivision teams in red zone offense as they’ve scored 10 of 19 times. Negative plays (penalties or plays that lose yardage) and turnovers all have been factors in UW’s futility. It must be cleaned up if it hopes to win this game — or any game the rest of the season. WyoSports senior editor Robert Gagliardi with his weekly installment of the Mountain West football power rankings and picks for Week 12 of the college football season. Look for this every week during the football season, and as always, your feedback is welcome. 1. Colorado State (9-1 overall, 5-1 MW): Remains No. 1 again this week. Winners of eight straight and the only MW team ranked (23rd in the coaches poll, 25th AP). Despite its success, the Rams must win out and hope Boise State loses one of its final three games to claim the Mountain Division title. This week: Off. 2. Boise State (7-2, 5-1): A close second behind Colorado State, and is the only team to beat the Rams this season. You can make a case for the Broncos to be at the top. Leads the MW in scoring (37.7 ppg) and is second with 43 touchdowns scored. This week: vs. San Diego State, 8:15 p.m. MT Saturday (ESPNU). Boise State had trouble stopping New Mexico’s run game last week. It will be better this week. Boise St. 27, San Diego St. 16. 3. Utah State (7-3, 4-1): No matter who plays quarterback, the Aggies have speed on the edges and the league’s leading defense in scoring (19.2 ppg), rushing (96.1 ypg), turnover forced (27) and turnover margin (+13). This week: vs. New Mexico, 2 p.m. MT Saturday (ESPNews). New Mexico may get some rushing yards as it is third in the nation running the ball, but not nearly enough as the Aggies will roll. Utah State 38, New Mexico 17. 4. Air Force (7-2, 3-2): Quietly putting together a solid season, and Troy Calhoun should be a candidate for Coach of the Year in the league. The defense is rock-solid, including top 10 against the run. This week: vs. Nevada, noon MT Saturday (ROOT). One of the best match-ups of the week. Can the Falcons’ defense slow down Nevada senior quarterback Cody Fajardo? It will enough to remain unbeaten at home. Air Force 24, Nevada 20. 5. Nevada (6-3, 3-2): The favorite to win the West Division, and the only team in that division with a winning road record (3-1). This week: at Air Force, noon MT Saturday (ROOT). Should be a good game, but I got to go with the home team as the West Division race will continue to be a jumbled mess. Air Force 24, Nevada 20. Here are some notes and quotes that didn’t make the print or online platforms for WyoSports this week leading up to Saturday’s Wyoming-Air Force football game. –Air Force has modified its offense some over the years from a true triple-option. Make no mistake, the Falcons are option-oriented, but run a lot of those concepts out of different formations and blocking schemes. But it is still option football. “We appreciate Air Force’s commitment to sticking to their guns,” Bohl said. 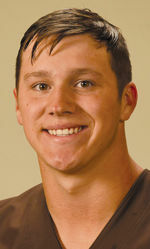 WyoSports senior editor Robert Gagliardi did a question-and-answer session with Brent Briggeman, who covers Air Force football for The Gazette in Colorado Springs, Colo., about Saturday night’s game with the University of Wyoming. Air Force has struggled on defense in its last two games — losses to Utah State and Boise State — where it was outscored 94-40. What is the problems defensively, or is it more that Utah State and Boise State are that good on offense? The Falcons have been slow to adjust to particular schemes. Against Utah State, quarterback Chuckie Keeton was able to break the pocket and then wait and see if Air Force’s defensive backs were going to stay in coverage, in which case he would run. When defensive backs would break coverage, he would hit open receivers. Air Force never figured out the best plan to stop him. Against Boise State, the bubble screens — quick-hitting passes to receivers at or behind the line of scrimmage — accounted for 17 of the pass completions (on 17 attempts) and routinely went for 6-10 yards. Both of those teams executed extremely well and will have success against most teams, but Air Force’s inability to react certainly played a part. First off, Wyoming football coach Dave Christensen answered questions about this year’s Air Force team — the one the Cowboys play Saturday night at Air Force to open Mountain West play. But you knew questions would soon follow about Christensen’s obscenity-laced tirade toward Air Force coach Troy Calhoun after last season’s 28-27 Cowboys loss to the Falcons in Laramie. Christensen, who was suspended one game and fined $50,000 for the incident, answered the questions with class and calmness. But one could tell he didn’t want to spend all of Monday answering questions about it. By now you know that Wyoming athletics director Tom Burman suspended football coach Dave Christensen Monday for one week and fined him $50,000 for his postgame, profanity-laced tirade with Air Force coach Troy Calhoun after the Cowboys’ 28-27 home loss on Oct. 13. Christensen won’t be allowed any access to the team or facilities this week, and Burman said he will be reinstated Sunday morning. Christensen will be paid while he’s suspended, but Burman said a week’s pay for Christensen is “significantly less” than the fine he levied. The discipline was not only a result of Christensen’s reaction to Calhoun after the game, but also from the YouTube video that surfaced last last week that captured the outburst. Burman said he first saw the video last Monday — two days after the game. Why didn’t Burman suspend Christensen sooner is what many fans are asking? Burman said he didn’t want to make a “hasty” decision and wanted to consult with school president Tom Buchanan and UW’s legal advisers to see if what he had in mind would fly. Burman said Christensen’s actions were a suspendable offense as soon as he saw the video. Burman also said he didn’t have his mind made up about the suspension and fine before last Saturday’s 42-14 loss at Fresno State, but knew something more needed to be done other than apologies from Christensen the Sunday and Monday after the Air Force game. “In my mind it doesn’t matter which game you suspend him for if you choose to make that decision,” Burman said. It’s the halfway point of the season in the Mountain West. All 10 teams have played at least six games, and some have played seven. 1. Boise State (5-1 overall, 2-0 MW): The offensive fire power isn’t there, but the defense has been stellar. The Broncos lead the MW in scoring defense (14.7 ppg), pass defense (173.3 ypg), total defense (334.7 ypg), turnover margin (+11), pass efficiency defense (103.4) and first downs allowed (109). 2. Nevada (6-1, 3-0): The most dynamic offense that leads the MW in scoring (41 ppg) and total offense (549.9 ypg). The Wolf Pack can run and throw with the best of them. A fourth-quarter letdown at home against South Florida is the only thing keeping this team from being undefeated and probably nationally ranked. The defense needs to improve and the better teams in the conference still await.